Tubes Versus Transistors -- Is There an Audible Difference? .Engineers and musicians have long debated the question of tube sound versus transistor sound. Previous attempts to measure this difference have always assumed linear operation of the test amplifier. This conventional method of frequency response, distortion, and noise measurement has shown that no significant difference exists. This paper, however, points out that amplifiers are often severely overloaded by signal transients (THD 30%). Under this condition there is a major difference in the harmonic distortion components of the amplified signal, with tubes, transistors, and operational amplifiers separating into distinct groups. As a recording engineer we became directly involved with the tube sound versus transistor sound controversy as it related to pop recording. The difference became markedly noticeable as more solid-state consoles made their appearance. Of course there are so many sound problems related to studio acoustics that electronic problems are generally considered the least of one's worries. After acoustically rebuilding several studios, however, we began to question just how much of a role acoustics played. During one session in a studio notorious for bad sound we plugged the microphones into Ampex portable mixers instead of the regular console. The change n sound quality was nothing short of incredible. All the acoustic changes we had made in that studio never had brought about the vast improvement in the sound that a single change in electronics had. Over a period of several years we continued this rather informal investigation of the electronic sound problem. In the past, we have heard many widely varied theories that explain the problem, but no one, however, could actually measure it in meaningful terms. Anyone who listens to phonograph records closely can tell that tubes sound different from transistors. Defining what this difference is, however, is a complex psycho-acoustical problem. Any investigation of this admittedly subtle phenomenon must really begin with a few human observations. Some people try to point out and describe valid differences. Others just object to the en tire thesis and resort to spouting opinions. It is the listener's job to sort out the facts from the fiction. Fig. 1. Simplified bipolar logarithmic amplifier schematic. Electrical engineers, especially the ones who design recording equipment, can prove that there is no difference in tube or transistor sound. They do this by showing the latest specification sheets and quoting electronic figures which are visually quite impressive. It is true, ac cording to the parameters being measured, that there is only a marginal difference in the signal quality. But are there some important parameters which are not being measured? One engineer who admits that there might be some marginal difference in the sound says, “You just have to get used to the nice clean sound of transistors. What you’ve been listening to on tubes is a lot of distortion.” Of course the question which comes to mind is, What is this distortion and how is it measured? Psychoacoustically, musicians make more objective subjects than engineers. While their terms may not be ex pressed in standard units, the musician’s “by ear” measuring technique seems quite valid. Consider the possibility that the ear’s response may be quite different than an oscilloscope’s. When we heard an unusually loud and clear popular-music studio recording, we tried to trace its origin. In almost every case we found that the recording console had vacuum-tuba preamplifiers. We are specific in mentioning preamplifiers because in many cases we found hybrid systems. Typically this is a three- or four-track console that is modified with solid-state line amplifiers to feed a solid-state eight- or sixteen-track tape machine. Our extensive checking has indicated only two areas where vacuum-tube circuitry makes a definite audible difference in the sound quality: microphone preamplifiers and power amplifiers driving speakers or disc cutters. Both are applications where there is a mechanical— electrical interface. As the preliminary basis for our further investigation we decided to look into microphone and preamplifier signal levels under actual studio operating conditions. Moping to find some clues here we would then try to carry this work further and relate electrical operating conditions to acoustically subjective sound colorations. Our search through published literature showed that little work has been undertaken in this area. Most microphone manufacturers publish extensive data on output levels under standard test conditions [ but this is rather hard to convert to terms of microphone distances and playing volumes. Preamplifier circuit design is well, covered for noise considerations , but not from the standpoint of actual microphone operating levels. Distortion has been treated in numerous ways but with very few references to musical sound quality . To get a rough idea of the voltage output from different types of microphones, an oscilloscope was paralleled across inputs of a console. During the normal popular-music type sessions, peak readings of 1 volt or more were common, especially from close-up microphones on voice and drums. Due to the linear voltage scale, oscilloscope measurements over more than a 10-dB range tire difficult. 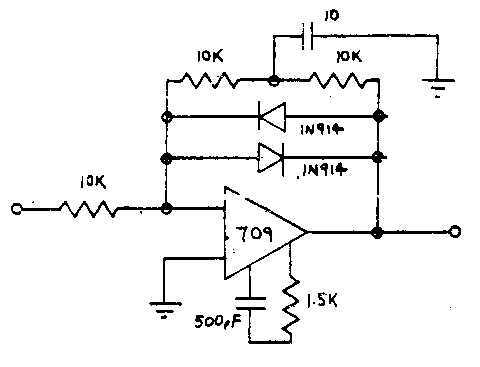 By building a simple bipolar logarithmic amplifier, the useful measuring range was extended to about four decades (Fig. 1). Considerable studio observation finally ted to the construction of a peak holding type decibel meter. This circuit retained transient peaks of more than 50 microseconds within 2-dB ac curacy for about 10 seconds; long enough to write them down. Using the logarithmic oscilloscope display and the peak meter together proved very useful in gathering a wealth of data about real-life microphone signals. Table 2. 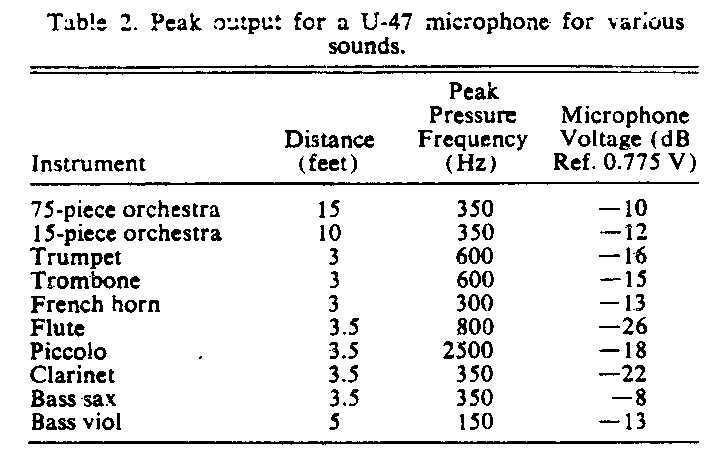 Peak output for a U-47 microphone e for various sounds. Table I shows the normal peak outputs from several popular types of studio microphones. All the readings are taken with the microphone operating into the primary of an unloaded transformer. Pickup distances are indicated for each instrument and were determined by normal studio practice. Table II is an abridgement of a similar study done by Fine Recording, Inc., several years ago. Details of this test setup are not available but the readings are probably taken without the 6-dB pad commonly used on the U-47 microphone today. Sonic calculations based on the manufacturer’s published sensitivity for these microphones indicates that acoustic sound-pressure levels in excess of 130 dB are common. While the latest console preamplifiers have less noise, less distortion, and more knobs than ever before, they are not designed to handle this kind of input level. In most commercially available preamplifiers, head room runs on the order of +20 dBm, and gain is commonly set at 40 dB. With these basic parameters it is clear from the data shown in Tables I and II that severe overloads can occur on peaks from almost all instruments. For example, a U-87 microphone gives a peak output of — 1 dB from a large floor tom. Amplification by 40 dB in the microphone preamplifier results in an output swing of +39 dBm or almost 20dB above the overload point. Logically a peak of this magnitude should be severely distorted. Most recording consoles today have variable resistive pads on the microphone inputs 10 attenuate signal levels which are beyond the capabilities of the preamplifier. The common use of these input pads supposedly came about with the advent of loud rock music; however, this is not true in fact. For some 20 years it has been common to use a Neumann U-47 microphone for close microphone recording of brass and voice. 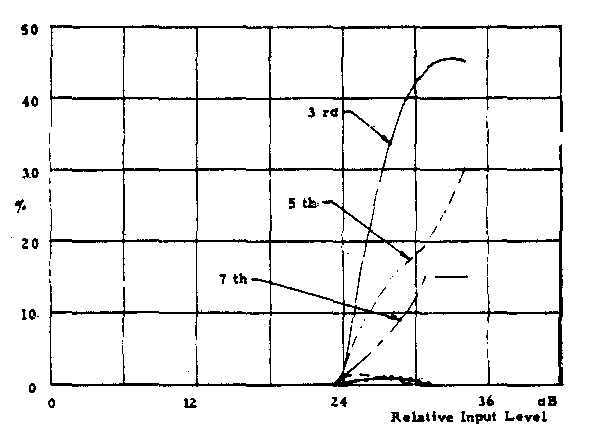 Table H shows output levels requiring 10—20 dB of padding under these conditions, and this does agree with recording practice today where solid-state amplifiers are used. But most tube consoles did not have input pads and yet the same microphone performed with little noticeable distortion. Certainly brass players and singers are not that much louder today than they were yesterday. The microphone distance is about the same. 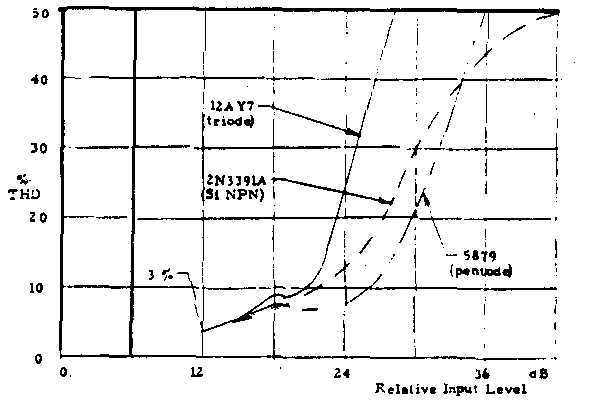 The preamplifier specifications have not changed that much. Yet transistors require pads and tubes do not. Here then is the hypothesis for further investigation. In the usual evaluation of audio preamplifiers it is assumed that they are operated in their linear range, i.e., harmonic distortion less than 10%. In this range tubes and transistors do have very similar performance characteristics. But the preceding section points out that amplifiers are often operated far out of their linear range at signal levels which would cause severe distortion. Under these conditions, tubes cod transistors appear to behave quite differently from a sound viewpoint. Three commercially available microphone preamplifiers of different designs were set up in the recording studio. Each amplifier was adjusted for a gain of 40 dB and an overload point of 3% total harmonic distortion (THD) at + 18 dBm. Preamplifier I was a transistor design, preamplifier 2 was a hybrid operational amplifier, and preamplifier 3 was a vacuum-tube triode design. The amplifier outputs were terminated in 600-ohm loads and bridged by the monitoring system. The test signal. U-87’’ microphone, and large floor tons were switchable to each preamplifier input. An informal group of studio personnel listened to the outputs of the three amplifiers on the normal control room monitor speakers. As the teat signal was switched from one amplifier to another, the listeners were asked to judge the sound quality. The output of amplifiers 1 and 2 was unanimously judged to be severely distorted. Amplifier 3, however, sounded clean. The test was repeated several times inserting attenuating pads in the microphone line until each amplifier sounded undistorted. Amplifier 1 could stand overloads of 5—10 dB without noticeable distortion. Amplifier 2 showed notice able distortion at about 5-dB overload. Further listening revealed that it was only in the range of early overload where the amplifiers differed appreciably in sound quality. Once the amplifiers were well into the distortion region, they all sounded alike—distorted. In their normal non-overload range all three amplifiers sounded very clean. The listening tests clearly indicate that the overload margin varies widely between different types of amplifiers. Engineering studies show that any amplifier adds distortion as soon as the overload point is reached. The tests show that all amplifiers could be overloaded to a certain degree without this distortion becoming notice able. It may be concluded that these inaudible harmonies in the early overload condition might very well be causing the difference in sound coloration between tubes and transistors. Table 1. 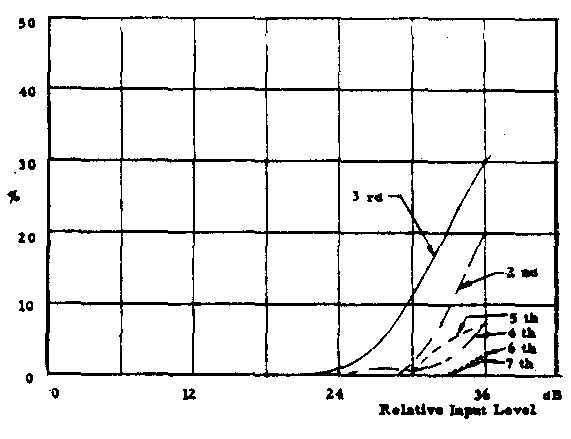 Peak microphone output levels for percussive sounds. 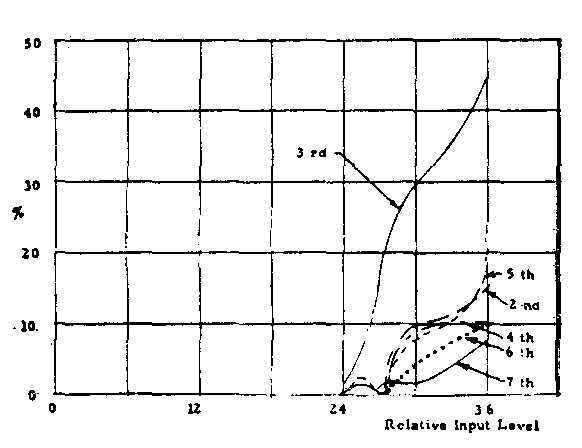 To get a general representation of the character of harmonic distortion in audio amplifiers, overload curves were plotted for about fifty different circuits. The tube circuits used the popular 12AY7 and 12AX7 triodes, the 8628 and 7586 triode nuvistors, and the 5879 pentode. These tubes have all been extensively used in recording console preamplifiers. The 2N3391A, 2N5089, and 2N3l 17 silicon NPN transistors were also chosen be cause of their extensive use in console and tape recorder circuitry. For comparison purposes tests were also run on the 2N5087 which is the PNP sister of the 2N5089. Operational amplifiers included the popular 709 and LM3OI monolithic units and two commercially available hybrid designs used in recording consoles. Fig. 2. Single-stage amplifier comparison of total harmonic distortion (THD). The curves shown in Fig. 2 are representative of the general distortion characteristics of single-stage class A audio amplifiers. The devices are all operating open loop (no feedback) with a bias point which allows for maxi mum undistorted output swing. The curves are referenced to a common point of 3% (THD), regardless of actual input or output levels. Since the objective of these comparisons is to detect variations in the slopes of the distortion characteristics, the x axis is a scale of relative level independent of circuit impedance considerations. 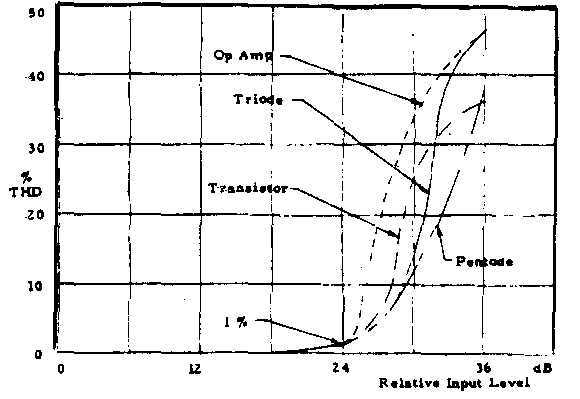 These particular curves were chosen from the many plotted as representative of different families: silicon transistors, triodes, and pentodes. A quick look shows that the often versed opinion that tubes overload more gently than transistors is obviously a myth. Fig. 4. 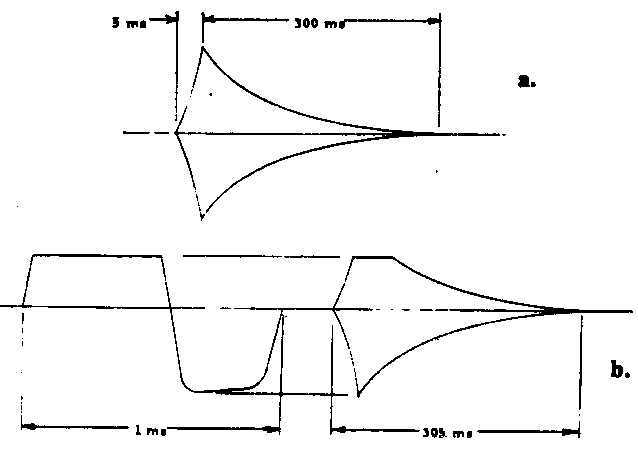 Distortion components for two-stage triode amplifier. Fig. 3 shows the distortion characteristics for four different commercially available preamplifiers, using two or more stages of amplification. All the circuits use feed back, a couple are push—pull. Each amplifier is operating into 600 ohms at a gain of 40 dB. As in the previous curves, there is a common reference point of 1% THD. While these curves show a marked difference from the single-stage amplifiers, a review of the many different amplifiers tested shows that the slopes of all THD curves run about the same. The lack of a wide variation between the curves indicates that THD plots are not very relevant to what the ear hears in the listening tests. Fig. 3. Multistage amplifier comparison of total harmonic distortion (THD). Another series of tests were made an the same group of preamplifiers using a spectrum analyzer to measure the amplitude of individual harmonics. Each amplifier was driven 12 dB into overload, starting from a reference point of 1% third harmonic distortion. Every harmonic to the seventh was plotted. Since it is not possible to mea sure the relative phase of the harmonics on the spectrum analyzer, the overload waveforms were recorded for Fourier analysis on the computer. The resulting plots divided amplifiers into three distinct categories. Fig. 6. Distortion components for two-stage pentode amplifier. Fig. 8. Distortion components for multistage capacitor-coupled transistor amplifier. Fig. 4 shows the distortion components for a typical two-stage 12AY7 amplifier. This particular design is quite representative of several single-ended, multistage triode tube amplifiers tested. The outstanding characteristic is the dominance of the second harmonic followed closely by the third. The fourth harmonic rises 3—4 dB later, running parallel to the third. The fifth, sixth, and seventh remain below 5% out to the 12-dB overload point These curves seem to be a general characteristic of all the triode amplifiers tested, whether octal, miniature, nuviator, single-ended, or push—pull. Fig. 5 is the waveform at 12 dB of overload. The clipping is unsymmetrical with a shifted duty cycle. Again this is characteristic of all the triode amplifiers tested. Fig. 6 shows the distortion components for a two-stage single-ended pentode amplifier. Here the third harmonic is dominant and the second rises about 3 dB later with the same slope. Both the fourth and the fifth are prominent while the sixth and seventh remain under 5% - The waveform at l2-dB Over load (Fig. 7), is similar to the triode, but its duty cycle is not shifted as much. It is not reasonable to assume that virtually all tube amplifiers can be represented by these two examples. However, the major characteristic of the tube amplifier is the presence of strong second and third harmonics, sometimes in concert with the fourth and fifth, but always much greater in amplitude. Harmonica higher than the fifth are not significantly the overload is beyond 12 dB. These characteristics seem to hold true for wide variations in circuit design parameters. The extreme difference in the tube amplifiers is the interchanging of the position of the second and third harmonics. This effect is not just a characteristic of the pentode, it is common to triodes too. Fig. 9. Waveform for transistor amplifier of Fig. 8 at 12-dB overload,. 1000-Hz lone. Figs. 9 and 10 show the characteristics of two transistor amplifiers. 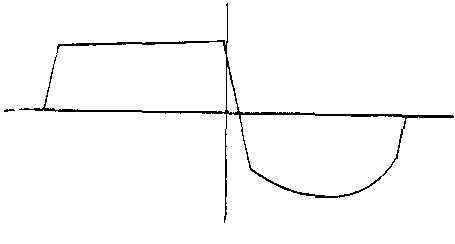 Like the previous figures the curves, are representative of all the transistor amplifiers tested. The distinguishing feature is the strong third harmonic component. All other harmonica are present, but at a much lower amplitude than the third. When the overload reaches a break point, all the higher harmonics begin to rise simultaneously. This point is generally within 3—6 dB of the 1% third harmonic point. The waveforms of these amplifiers (Figs. 9 and 11) are distinctly square wave in form with symmetrical clipping and an almost perfect duty cycle. Both amplifiers shown have single- ended inputs and push-pull outputs. However, the circuit designs are radically different. Fig. 10. Distortion components for multistage transformer-coupled transistor amplifier. Fig. 12 is a hybrid operational amplifier. The third harmonic rises steeply as the dominant distortion component in a characteristic similar to the transistor. Also rising very strongly from the same point are the fifth and seventh harmonies. All even harmonics are suppressed completely. The waveform of Fig. 13 is a perfect square wave. As a classification group, operational amplifiers have the most uniform characteristics with almost no deviation from the curves shown in this example. Fig. 11. Waveform for transistor amplifier of Fig. 10 at 12-dB overload, 1000-Hz tone. Fig. 5. 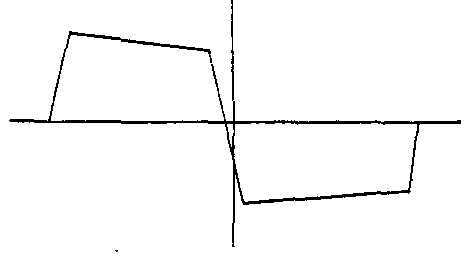 Waveform of triode amplifier of Fig. 4 at 12.dB overload, t000-Hz tore. Fig. 7. 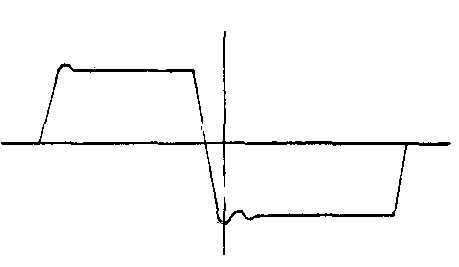 Waveform of pentode amplifier of Fig. 6 at 12- dB overload, 1000-Hz tone. Fig. 12. Distortion components for monolithic operational amplifier with hybrid output stage. Fig. 13. 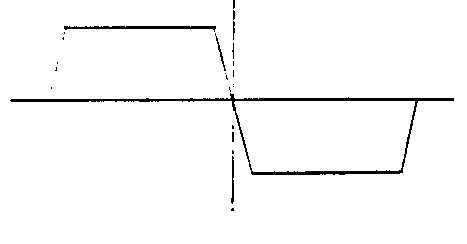 Waveform for operational amplifier of Fig. 12 at t2-dB overload, 1000-Hz tone. In view of the transient nature of audio signals, steady-state single-frequency distortion analysis could yield questionable results. Indeed, the arguments for and against sine-wave and pulse test signals for audio system testing have been the subject for a number of engineering papers [ [ For our purposes, however, a few minutes toying with an electronic synthesizer quickly proved that musical instruments do not produce fast pulses. For example, a good simulation of the large floor torn used in the amplifier listening tests is a 100-Hz tone modulated with an envelope rise time of 5 ms and a decay time of 300 ma. Also an extensive study of trumpet tones (6) measured the rise time of the fastest staccato notes at 12 ma. Certainly, rise times of these orders can not be considered pulses for audio amplifiers with passbands ex tending to 20 kHz or better. Just to further prove the correctness of the preceding steady-state results, the synthesized floor torn signal was used to test the mane amplifiers at the same level as the microphone signal. Careful observation of the amplified signal showed that envelope clipping was identical to the steady-state clipping level (Fig. 14). There were no glitches or other fast transient phenomena in the output signal. The basic cause of the difference in tube and transistor sound is the weighting of harmonic distortion components in the amplifier’s overload region. Transistor amplifiers exhibit a strong component of third harmonic distortion when driven into overload. This harmonic produces a “covered” sound, giving the recording a restricted quality. Alternatively a tube amplifier when over loaded generates a whole spectrum of harmonics. Particularly strong are the second, third, fourth, and fifth overtones which give a full-bodied “brassy’ quality to she sound. The further any amplifier is driven into saturation, the greater the amplitude of the higher harmonics like the seventh, eighth, ninth, etc. These add edge to the sound which the ear translates to loudness information. Overloading an operational amplifier produces such steeply rising edge harmonica that they become objectionable within a 5-dB range. Transistors extend this overload range to about 10 dB and tubes widen it 20 dB or more. Using this basic analysis, the psychoacoustic characteristics stated in the beginning of this paper can be related to the electrical harmonic properties of each type of amplifier. It was not part of the original intent of this paper to analyze operational amplifiers. However, the tests show that they tall into a distinct class of their own. Basically, operational amps produce strong third, filth, and seventh harmonics when driven only a few dB into over load. The resultant sound is metallic with a very harsh edge which the ear hears as strong distortion. Since this sound is so objectionable, it acts as a clearly audible overload warning signal. Consequently, operational amplifiers are rarely operated in their saturated region. This results in a very cleanly amplified sound with little coloration and true dynamic range within the limitations of the amplifier. True dynamic range is not necessarily the determinant of good sound reproduction, however, since it is much greater than any disc or tape system presently available. Because of their characteristics, operational amplifiers produce only the top end of the dynamic range which contains all the transients but lacks the solid pitch information which the ear hears as music. When records of true dynamic range are played on a limited-range system, they sound very thin. This relates directly to the originally cited listener’s comment that transistor records were very clean but sounded sibilant and cymbally. The transistor characteristics which our subjects noted were the buzzing or white-noise sound and the lack of ‘punch.” The buzz is of course directly related to the edge produced by overloading on transients. The guess that this is white noise is due to the fact that many of the edge harmonics like the seventh and ninth are not musically related to the fundamental. The ear hears these dissonant tones as a kind of noise accompanying every attack. The lack of punch is due to the strong third harmonic which is inaudibly “blanketing” the sound. This is correctable by using a large enough pad to prevent all peaks from reaching the amplifier’s saturated region. But from a practical standpoint, there is no way of determining this on most consoles. Adding auxiliary peak indicators on the input preamplifiers could alleviate both these problems, and the sound would be very close to that of the operational amplifier in its linear region. Vacuum-tube amplifiers differ from transistor and operational amplifiers because they can be operated in the overload region without adding objectionable distortion. The combination of the slow rising edge and the open harmonic structure of the overload characteristics form an almost ideal sound-recording compressor. Within the 15—20-dB “safe” overload range, the electrical output of the tube amplifier increases by only 2—4 dB, acting like a limiter. However, since the edge is increasing within this range, the subjective loudness remains uncompressed to the ear. This effect causes tube-amplified signals to have a high apparent level which is not indicated on a volume indicator (VU meter). Tubes sound louder and have a better signal-to-noise ratio because of this extra subjective head room that transistor amplifiers do not have. Tubes get punch from their naturally brassy overload characteristics. Since the loud signals can be recorded at higher levels, the softer signals are also louder, so they are not lost in tape hiss and they effectively give the tube sound greater clarity. The feeling of more bass response is directly related to the strong second and third harmonic components which reinforce the “natural” bass with “synthetic” bass. In the context of a limited dynamic range system like the phonograph, recordings made with vacuum-tube preamplifiers will have more apparent level and a greater signal to system noise ratio than recordings made with transistors or operational amplifiers. Having divided amplifiers into three groups of distortion characteristics, the next step is to determine how the harmonics relate to hearing. There is a close parallel here between electronic distortion and musical tone co oration that is the real key to why tubes and transistors sound different. Perhaps the most knowledgeable authorities in this area are the craftsmen who build organs and musical instruments. Through many years of careful experimentation these artisans have determined how various harmonics relate to the coloration of an instrument’s tonal quality. The primary color characteristic of an instrument is determined by the strength of the first few harmonics. Each of the lower harmonics produces its own characteristic effect when it is dominant or it can modify the effect of another dominant harmonic if it is prominent. In the simplest classification, the lower harmonics are divided into two tonal groups. The odd harmonics (third and fifth) produce a “stopped” or “covered” sound. The even harmonics (second, fourth, and sixth) produce “choral” or “singing” sounds. The second and third harmonics are the most important from the viewpoint of the electronic distortion graphs in the previous section. Musically the second is an octave above the fundamental and is almost inaudible; yet it adds body to the sound, making it fuller. The third is termed a quint or musical twelfth. It produces a sound many musicians refer to as “blanketed.” Instead of making the tone fuller, a strong third actually makes the tone softer. Adding a fifth to a strong third gives the sound a metallic quality that gets annoying in character as its amplitude increases. A strong second with a strong third tends to open the “covered” effect. Adding the fourth and the fifth to this changes the sound to an “open horn” like character. The higher harmonics, above the seventh, give the tone “edge” or “bite.” Provided the edge is balanced to the basic musical tone, it tends to reinforce the fundamental, giving the sound a sharp attack quality. Many of the edge harmonics are musically unrelated pitches such as the seventh, ninth, and eleventh. Therefore, too much edge can produce a raspy dissonant quality. Since the ear seems very sensitive to the edge harmonics, con trolling their amplitude is of paramount importance. The previously mentioned study of the trumpet tone shows that the edge effect is directly related to the loudness of the tone. Playing the same trumpet note loud or soft makes little difference in the amplitude of the fundamental and the lower harmonics. However, harmonics above the sixth increase and decrease in amplitude in al most direct Proportion to the loudness. This edge balance is a critically important loudness signal for the human ear. The author wishes to thank Waller Sear and Peter Scheiber for innumerable helpful discussions on the musician’s viewpoint of sound. He also wishes to thank John Olson of RCA and Steve Temmer of Gotham Audio for the loaning of amplifiers. “Neumann Transistor Condensor Microphones,” Gotham Audio Corp., Sales Bull. 1971. A. D. Smith and P. Ft. Wittman, “Design Considerations of Low-Noise Audio Input Circuitry for a Professional Microphone Mixer,” I. Audio Eng. Soc., vol. 18, pp. 140—l56 (Apr. 1970). 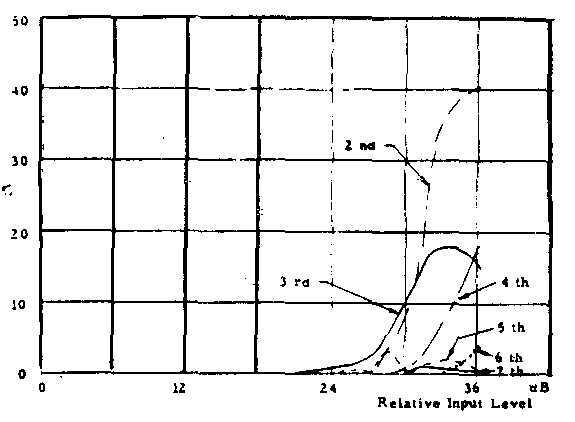 A. Schaumberger, “The Application of Impulse Measurement Techniques to the Detection of Linear Distortion,” J. Audio Eng. Soc., vol. 19, pp. 664—668 (Sept. 1971). M. Otala, “Circuit Design Modifications for Minimizing Transient Inter-modulators Distortion in Audio Amplifiers,” J. Audio Eng. Soc., vol. 20, pp. 396—399 (June 1972). Langford-Smith. Radiotron Designer’s Hand book (RCA. 1953). chap. 14. C. Risset, “Computer Study of Trumpet Tones,” Bell Telephone Laboratories. File MM-66-t222-2. J. R. Ashley, T. A. Saponas, and R. C. Matson, “rest Signals for Music Reproduction Systems,” IEEE Spectrum, vol. 8, pp. 53—61 (July 1971). A. H. Benade, Horns, Strings and Harmony (Doubleday, New York, 1960). R. A. Schaefer, “New Techniques for Organ Tone Generation,” I. Audio Eng. Soc., vol. 19, pp. 570—575 (July/Aug. 1971). 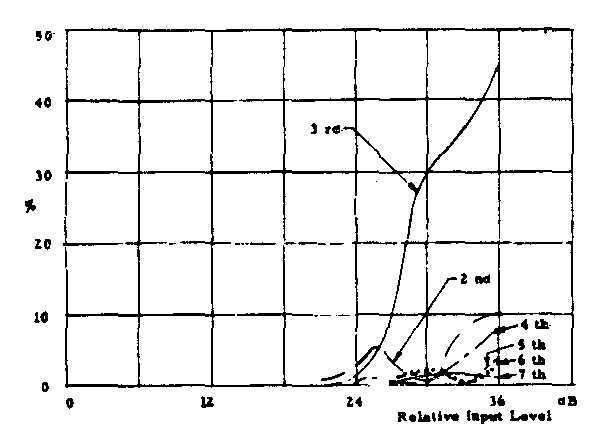 R. Langevin, “Intermodulation Distortion in Tape Recording,” I. Audio Eng. Soc., vol. 11, pp. 270—278 (July 1963). Russell O. Hamm received his engineering training at the University of New Hampshire. He worked for Vidcom Electronics and later the Fine Recording division of that Company, designing and supervising the installation of their extensive 16-track recording facilities. While with Fine Recordings, Mr. Hamm did a great deal of experimentation in stereophonic and quadraphonic sound for records and motion pictures which, in conjunction with Peter Scheiber, formed the basis for the development of the present matrix-quad record, Mr. Hamm’s record-producing and engineering credits include albums, commercials, and motion-picture soundtracks by many well-known artists. Mr. Hamm presently serves as a Consultant to Sear Sound Studios in New York and is constructing Ditanfra Studios in the Virgin Islands. ---RUSSELL O. HAMM Sear Sound Studios, New York, N. Y.